Have you ever dreamed of writing a novel? Every year people around the world take the plunge and become an author during the month of November. If you've always wanted to write a novel, or try to write a novel, then this is the year to take advantage of National Novel Writing Month (aka NaNoWriMo). It is a free, annual challenge that takes place every November, where novelists strive to start, write and complete the first draft of their 50,000+ word novel in just 30 days. Last year over six hundred and fifty thousand people worldwide took up the challenge. In the Naperville region, which serves the western and southern suburbs of Chicago, 148 participants completed their novels in 2013. They were bolstered by online forums and local events, and had fun along the way. The Naperville region of NaNoWriMo, representing the cities and suburbs west of Chicago, has partnered with area libraries to offer four preparatory workshops. The Naperville region of NaNoWriMo is partnering with many area libraries to offer write-in events in November for people to use to work on their novel while others around them are working on theirs. For more information see the Library Crawl 2015 page. All participants and their friends and family are welcome to attend the TGIO party December 5th at the Naperville Municipal Center. Come visit http://naperwrimo.org for more detailed event information. Fulfill your dream of becoming a novelist. See http://www.nanowrimo.org and send your questions to mliaisons -AT- naperwrimo.org. A: Absolutely nothing is required. 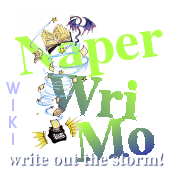 Donations to cover the nanowrimo.org website and administrative costs are accepted but are not necessary. Q: What do the winners get? A: A PDF file proclaiming them NaNoWriMo winners if they manage to complete at least 50,000 words in 30 days. More importantly, the happiness of completing at least 50,0000 words of a novel. Q: Where can I find out more information about the local events? A: Check out the 2013 Events page for detailed information about the local events. A: Actually, it turns out to be roughly 1,670 words per day, which turns out to be manageable. There are some exceptionally prolific writers who produce four times that amount... but many just barely get over the hump. The NaNoWriMo website and online discussion forums provide a lot of support; and we are organizing some weekly meetings locally for participants to use for writing and discussing their work. Q: Do I have to publish my novel? A: No. Some participants share their novels with other participants for critiquing; a few participants have had their NaNoWriMo novels published. There are no requirements here. A: Sign-ups can be done through the http://www.nanowrimo.org website. The NaNoWriMo contest proper begins at 12:01 midnight November 1st. Q: Who coordinates things for the Chicago Western Suburbs region? A: We (Tim Yao, Katherine Lato and Frank Dahlman) are volunteer municipal liaisons for the Chicago Western Suburbs region of NaNoWriMo (Illinois::Naperville). We are enthusiastic participants of previous NaNo's who want to help others find the joy of completion that we've found. We organize the kick-off writing session, weekly writing sessions and the TGIO party at the end. Q: Say I join the region, what do I do next? A: If you haven't already done so, please come to our regional forum and post a note introducing yourself to the other participants. You can say something about who you are and what you are writing. Which Novel Writing Books are Recommended? Glad you asked. We have a Useful_references_for_writers page where there are a lot of links collected! What about navigational aids for the nanowrimo site?